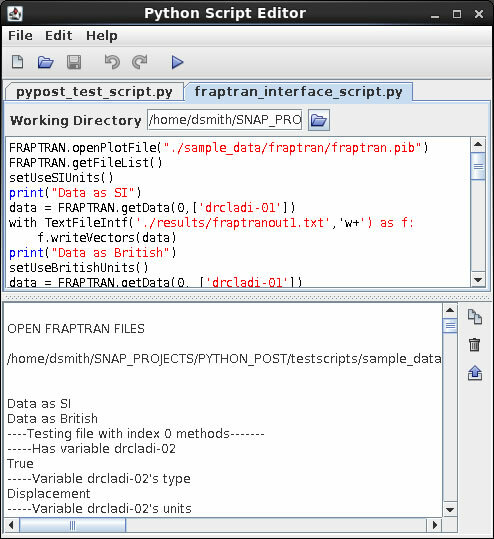 PyPost consists of a Python library and stand-alone Java application designed to provide advanced post-processing capability for engineering analysis codes and experimental data results. Read experimental data stored in NRC Databank and EXTDATA format. Read and write data to and from Microsoft Excel and Open Office spreadsheets. Read and write data to and from ASCII files. Perform a wide range of mathematical operations on time-dependent vector data. Interact directly with AptPlot to generate presentation quality plots in a wide range of formats. The first file is given an implicit file ID of 0 while the second fileâ€™s ID is explicitly set to 3. In some cases, the file format can be determined by examining the file and a single open plot file method may support multiple formats. PyPost includes an Advanced Equation Interpreter that can be used to perform calculatationa with the data read from plot and experimental data files. Data extracted from analysis code plot files and experimental data files typically consists of time dependent vector data stored in ChannelVector objects. # Plot the pressure drop across Pipe 106. Note that the minus operator "-" is overloaded to handle ChannelVector variables directly. The results of the calculation are stored in a newly created ChannelVector, deltaP. This new variable will contain all of the independent data values (time in this case) and the difference between the two dependent data values, 'p-106070000' and 'p-106010000', respectively. In this simple case, both variables came from the same RELAP5 run so each time dependent vector contains the same time values. The new time dependent vector simply contains the difference between the two pressure values at each time step. However, when a mathematical operation uses variables from different sources such as a RELAP5 run and an NRC Databank experimental data file, the time values in each vector will most likely not be identical. The post-processor handles this situation by interpolating the dependant data from the second vector using the time values from the first vector. The resulting vector contains all of the time values that fall within the bounds of the second vector, with dependent values calculated at these times using interpolated data from the second vector. If the operation involves two vector variables, the resulting vector will contain all of the x-values of the first vector that fall within the range of x-values of the second variable. Its y-values will be determined by performing the operation at each x-value using interpolated y-data from the second vector variable. If one of the operands is a scalar, the resulting vector will contain all of the x-values of the vector operand with its y-values determined by performing the operation using the scalar value and each y-value of the vector operand. A comprehensive test suite has been developed to verify proper operation of the software. Tests are organized into four categories, channel vector function tests, plot & experimental data file I/O interface tests, external application interface tests, and miscellaneous tests. Each set of tests is located in a separate subdirectory under the testscripts directory included in the distribution.